Mountainside Wines is a family owned and operated vineyard in the Grampians region of Victoria. They produce premium wines from vineyards that are hand-tended and hand-picked. This allows them to focus on ensuring their wines are rich and full of flavour. All their wines are made using grapes from a single vineyard. They strive to offer all visitors a personal and authentic experience when they visit and love showing the property with vineyard and winery tours. Founded and co-owned by fabulous lady of wine Jane Goninon, Mountainside are truly boutique with a tiny 2.5ha of vineyards that produce just three wines. This is artisan wine production at its best. Nebbiolo and Viognier are two of our favourite varieties, and are the pride of Mountainside Wines. So this is your chance to try them! 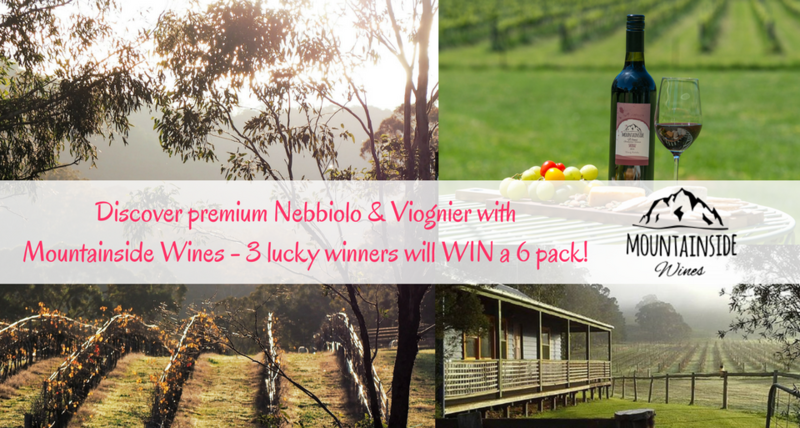 Enter below for your chance to one of three premium Mountainside Wines six-packs containing a mix of Nebbiolo and new release Viognier. Valued at $150 each. HOW TO ENTER Simply answer one simple question below and then enter your details to go into the draw! Competition closes midnight AEST 6th April 2018. This promotion is in no way sponsored, endorsed or administered by, or associated with, Facebook. You are providing your information to The Fabulous Ladies' Wine Society & Mountainside Wines and not to Facebook. This competition is only eligible for entry by Australian residents aged 18+. The winner(s) will be selected by The Fabulous Ladies' Wine Society. No discussion will be entered into regarding the selection of the winner(s). Winner(s) will be notified directly by phone and/or email using the entry details provided. We hope you are the lucky winner. We'll announce the winner after the competition closes on 6 April 2018. Why not find out more about Mountainside Wines?